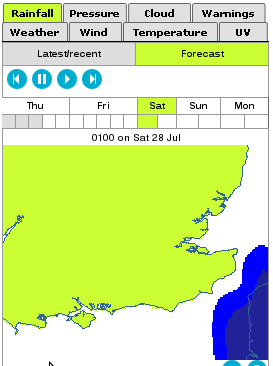 UK Met office prediction for this Saturday says it will only rain in France. I don’t want to mention London 2012 Olympics because it is copyrighted. I am in not way associated with the London 2012 Olympics I am just a British tax payer. How fast Usain Bolt could have run? By digitising video footage and then fitting a smoothed spline they are able to give estimates of Bolts time assuming, either that his speed at the end would match Thompson, or that he kept his acceleration 0.5 m/s2 after 8 seconds. In these two cases, we find that the new world record would have been 9.61 +/- 0.04 and 9.55 +/- 0.04 seconds, respectively, where the uncertainties denote 95% statistical errors. His coaches prediction of 9.52 is within the error bars, but could be called optimistic based on size of the 95% confidence limits. World record times would be valid with more favorable conditions so it is likely that Bolt can run 100 m faster than 9.5 seconds in the future.